GERMANY: Siemens is to construct two new service vessels to work on offshore wind projects in the North Sea. The first vessel will be used to service Vattenfall's German North Sea projects, the 288MW DanTysk and 288MW Sandbank developments. They are expected come online in 2015 and 2017 respectively. Another service vessel will be manufactured to work on Northland Power's 600MW Gemini Dutch project, due to be commissioned in 2016. Helicopters will also be used on all of the projects to provide additional transport capability. The two vessels are the third and fourth to be commissioned by Siemens. The first two specialist offshore wind service vessels are currently being constructed. The first hull was built at the Cemre shipyard in Turkey and has arrived at the Havyard shipyard in Norway in August – it's final building site. This vessel will "soon be ready for docking out and first sea trials", Siemens said. 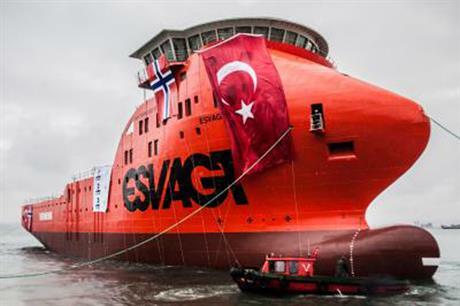 The second hull was launched in Turkey at the end of September, and has also been towed to Norway. Siemens expects the two vessels to leave Norway early 2015 to work on the Baltic 2 and Butendiek offshore wind projects in German waters.